Q: A longtime Hartford business was the setting for one of painter Norman Rockwell’s more famous covers for the Saturday Evening Post, appearing in the May 19, 1956 issue. Name the business. A: Harvey & Lewis Opticians on Pearl Street. Rockwell went there to get inspiration for his painting “New Glasses,” which you can view here, on the Facebook page of his estate. Read more about Rockwell’s visit on the excellent history page of the Harvey & Lewis website. Q: What Hartford institution disappeared on October 20, 1976? A: The Hartford Times. Launched in 1817 as the Hartford Weekly Times, the paper evolved into an afternoon daily that competed tooth-and-nail with the Hartford Courant. Editorially, it cast itself as the working person’s newspaper, in contrast to the more conservative and establishment-supporting Courant. By the 1970s, however, its circulation had dropped by half from the previous decade. In his “Images of Hartford, Volume III,” Wilson H. Faude blamed the Times’ closing on “a combination of the rising influence of television, union demands and costs, and the growth of suburban readership.” Frequent turnover in management didn’t help either; the Times’ final owner was the Register Publishing Co. of New Haven. The Hartford Times Building, which served as the paper’s final home from 1920 onward, now serves as the face of the University of Connecticut’s Hartford campus. Q: For whom is Murphy Road named? Source: "History of Hartford Streets," by F. Perry Close, published in 1969 by the Connecticut Historical Society. Q: What city institution—still with us—was founded in response to a steam boiler explosion that killed 21 and seriously injured as many as 50 on March 2, 1854, at the Fales and Gray railroad-car factory near Dutch Point? A: Hartford Hospital. Alarmed at the lack of facilities to care for such a large number of injured people, citizens held a public meeting two months to the day after the explosion and voted to create a public hospital. Until 1892, it provided medical services free of charge. "Hartford: An Illustrated History of Connecticut's Capital," by Glenn Weaver, published in 1982. "Fales & Gray Explosion—Today in History: March 2," on ConnecticutHistory.org. 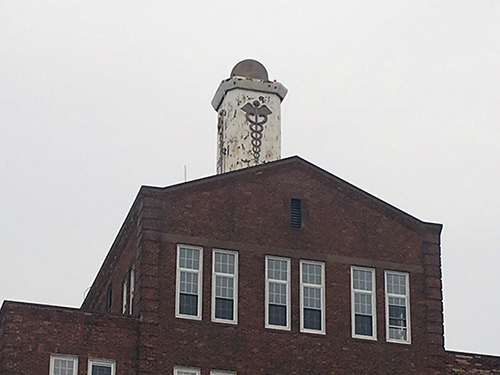 "How A Deadly Factory Explosion In 1854 Fueled The Creation Of City's First Hospital," Hartford Courant, September 15, 2014. Q: What key part of Hartford's infrastructure is named after a man who grew up in the city and was killed at the December 7, 1941 attack on Pearl Harbor? A: The Conland-Whitehead Highway, which connects traffic between downtown's Pulaski Circle and Interstate 91, is named in part after U.S. Navy Lt. Ulmont I. Whitehead Jr., a 1933 graduate of Bulkeley High School. His remains, along with those of 1,101 other servicemen, are entombed in the sunken USS Arizona. For more on Whitehead's short but accomplished life, read this 2002 Hartford Courant article. Q: What major artery of Hartford was originally called Talcott Mountain Turnpike? A: Albany Avenue. It was laid out as Talcott Mountain Turnpike by the Connecticut General Assembly in May 1678 but became known as the stage road to Albany, New York. It was deeded to the city by the Talcott Mountain Turnpike Company in 1854. 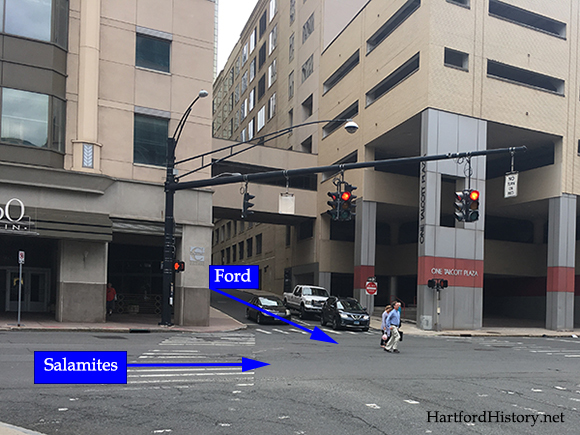 Q: Hartford found itself in the national spotlight on October 14, 1975, when a limousine carrying President Gerald R. Ford collided with a car full of teenagers at a city intersection. Thankfully, no one was seriously hurt. At what intersection did this occur? A: Talcott and Market streets, downtown. Ford had just spoken at a Republican fund-raising dinner at the newly opened Hartford Civic Center. His motorcade, bound for Bradley International Airport, turned down Talcott Street, toward Interstate 91. On Market Street, 19-year-old James Salamites of Meriden was driving north in his mother’s Buick LeSabre, with five friends as passengers. Hartford police had blocked off other intersections along the route, but not this one. Salamites had the green light; Ford’s driver, assuming Market Street had been blocked off, didn’t stop either. He spotted Salamites and tried to swerve out of the way, but it was too late. Salamites broadsided the armored limo. Secret Service agents and police swarmed both cars with guns drawn. Ford was unhurt, though one of the dignitaries accompanying him, Connecticut Republican Chairman Fred Biebel, suffered a broken hand. Immediately, the limo was sent back on its way to Bradley, despite heavy damage. Salamites and his passengers, meanwhile, underwent lengthy questioning until police concluded he wasn’t at fault and released him. Q: Where is this building located? The symbol affixed to the top is a big clue. A: The Burlingame Building of the Institute for Living, as seen from Washington Street. Finished in 1948, the eight-story building was originally used by the Institute to perform labotomies, then a new and much-heralded procedure for addressing severe mental illness. Sources: Emporis.com and "The History of Insanity: Shameful to Treatable," New York Times, September 20, 1998. Q: The Metropolitan District Commission, the agency that provides drinking water and wastewater treatment to Hartford and surrounding towns, began adding something to the drinking water in 1960. What was it? A: Fluoride. The MDC initially considered letting each of its member communities vote on making the change, but the board members eventually "reasoned that since the science behind fluoridation was fairly complex, they were the only ones who could make an informed decision," according to Kevin Murphy in his 2011 book, "Water for Hartford: The Story of the Hartford Water Works and the Metropolitan District Commission." Q: On February 24, 1961, the Federal Communications Commission granted a first-of-its-kind license to Hartford's WHCT-TV, Channel 18. What did the license allow? A: Pay television. Coming almost a decade before HBO, this operation sent scrambled signals over the air to subscribers, who had to enter codes into special boxes conntected to their TV sets to descramble them. The pay portion of WHCT's schedule ran in the evenings from 1962 to 1969, when the partnership behind it—station owner RKO General and descrambling-box seller Zenith—concluded that 5,000 subscribers weren't enough to justify the operating costs. WHCT, which many remember for the religous broadcasts of the Rev. Gene Scott in the 1970s and early 1980s, was located at 555 Asylum Avenue, across the street from the train station. The building is now home to ArtSpace Hartford, a mix of apartments and art spaces. For more on WHCT, see this article by Kyle Bookholz and this New York Times obituary on Thomas F. O'Neil, the RKO General executive who led the station. Q: Who was the first African-American elected to public office in Hartford? A: John C. Clark Jr., who was elected to the City Council in 1955 and served until 1963. The Clark Elementary School, at 75 Clark Street, is named for him. Q: In the 1920s, Ann Corio was living on Zion Street and attending Hartford Public High School when she embarked on a career that would earn her world acclaim as the "queen" of her profession. What was that profession? A: Burlesque stripper. As the Hartford Courant reported in October 2010, Corio's fame was such that Harvard University made her an honorary member of the Class of 1937. The article also noted that she “quit the burlesque circuit in her prime, turned off by the increasingly crass nature of the genre.” Ann Corio died in 1999. Q: What landmark restaurant of the 1950s, ‘60s, and ‘70s became such a hangout for legendary Democratic State Chairman John Bailey that his family bought one of its booths and installed it in their home, hoping he’d stay in more often? Q: Who is the dashing fellow depicted in this downtown statue? 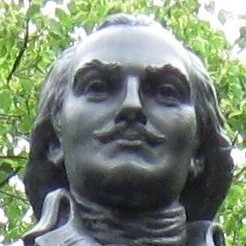 A: General Casimir Pulaski, the Polish general who died while fighting for General Washington's army in the Revolution and became known as the father of the American cavalry. The statue, built around 1970, stands adjacent to the Federal Building on Main Street, opposite the corner of Capitol Avenue. The pedestrian mall stretching behind the statue is also named after Pulaski. The Polish National Home, a center for Polish culture throughout the Hartford region, is located just around the corner, on Charter Oak Avenue. Q: James Renwick, the architect of St. Patrick’s Cathedral in New York City, also designed a Hartford church. Which one? A: First Presbyterian Church, built in 1870. It’s at the corner of Capitol Avenue and Clinton Street, adjacent to The Bushnell. The church's website has more on its history. Q: For whom is the Betances School named? Q: What Hartford radio station operated from 243 South Whitney Street from 1980 to 1988? A: WCCC, AM and FM. The wonderful site Connecticut Radio History has some great photos from this period in the station's history. (Yeah, those are the guys from Def Leppard.) The site's full history of WCCC is here.